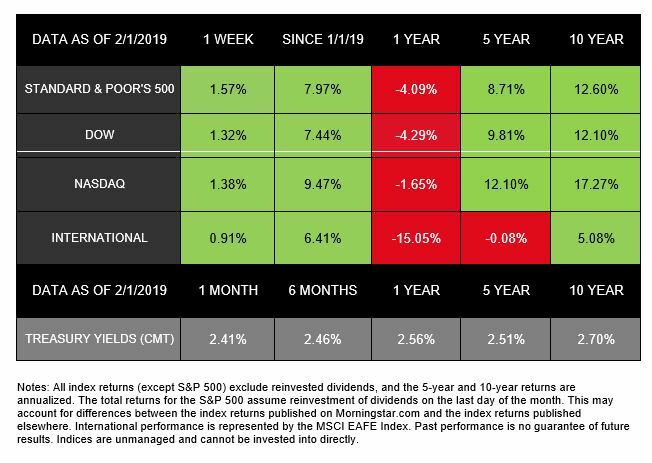 Last week closed out one of stocks’ top January performances in years. In fact, both the S&P 500 and Dow posted their best January results in at least 3 decades. For the week, major domestic indexes were also up. The S&P 500 gained 1.57%, the Dow added 1.32%, and the NASDAQ increased 1.38%. The Dow’s performance marked its 6th week of gains in a row. Internationally, MSCI EAFE stocks also posted growth, rising 0.91%. Federal Reserve Meeting: The Fed chose not to increase interest rates above its current 2.25% – 2.50% target. When releasing this update, the central bank noted that it would be “patient” when deciding about any future increases. The Fed’s signal that additional rate hikes may not be imminent helped improve market confidence. This week, we will continue to monitor corporate earnings season and will follow any developments in the U.S.–China trade negotiations. We will also watch for new data releases, especially those previously delayed by the government shutdown. If you have any questions, we’re here for you.